Born in Philadelphia and educated at the University of Pennsylvania, Walter Rand was a proud resident of Camden New Jersey where he built an outstanding career in public service to the City and the wider South Jersey region. Elected to the Camden Board of Education in 1971, the New Jersey State Assembly in 1975, and the New Jersey State Senate in 1981, Walter Rand was the chief architect of New Jersey’s Transportation Trust Fund and the South Jersey Transportation Authority, two critical accomplishments in the growth and development of the State and southern New Jersey in particular. 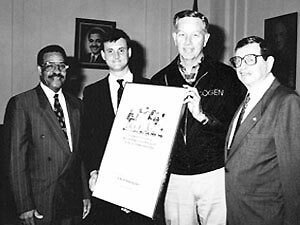 He also was instrumental in launching the Waterfront development that brought the State Aquarium and the Tweeter Center Amphitheater to Camden. 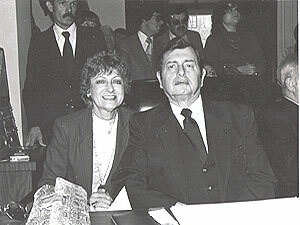 Senator Rand’s dedication to providing public support for transportation infrastructure was built on his conviction that the welfare of citizens and municipalities depends on their development as a region. In the same vein, he understood that higher education provides a powerful regional resource and he fought effectively to support Rutgers University’s Campus at Camden. In recognition of his devotion to Camden, to South Jersey, and to the ideal of public service, Rutgers University established the Senator Walter Rand Institute for Public Affairs (WRI) to honor his commitment to regional development and his of public service. As the southern campus of the state’s land grant institution, Rutgers-Camden is a fitting location for an institute to sustain Senator Rand’s legacy. Just as he combined a tireless search for facts and analysis to shape policy with a commitment to interact with his constituents, WRI blends applied research on policy issues critical to South Jersey and beyond with a commitment to bring citizens and leaders together to identify and address those issues. 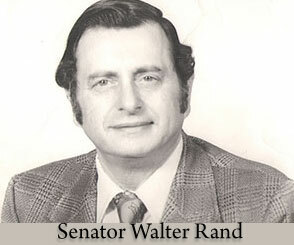 Read more about Senator Rand’s legacy (PDF file). Page last updated by Senator Walter Rand Institute for Public Affairs at 10:26 am October 13, 2015 . This page was printed from http://rand.camden.rutgers.edu/about/senator-rand/ at 4:06 PM Monday, April 22, 2019.